Ever felt like you’re just tapped out? You’ve been working all weekend and you don’t have the energy to throw together a meal. And since times are tough, you can’t afford to eat out either, no matter how many coupons you may have. So… it’s leftovers again, which is kind of a harsh word when you think about it. These are foods that have already seen their glory days. Foods that have been shoved into cold storage as the kitchen makes room for fresh meals. They still have plenty of nutritional value but lack the excitement of the new and don’t have much culinary status beyond that of fuel. Emptying the refrigerator into a soup pot is not all that inspiring. It’s like a Kindergarten collage. However wonderful each individual ingredient may be, it’s the glue that draws your attention because that was the part of the process that interested the “artist” most. Not exactly an appetizing metaphor. In soups the glue is the broth or stock. All the ingredients in the pot infuse their flavors into the liquid which holds it all together. 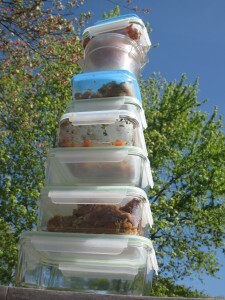 This can be a dangerous thing with leftovers because the foods might be already spent. If there is enough of a spark in these recycled foods, though, soup is the vehicle where they’re most likely to catch fire again and turn into something spectacular. That’s what happened this past Sunday and I’ve been coming back for seconds and thirds every day since. It started with my daughter’s 10th birthday party. Despite almost two years in the midwest, she still sees herself as a Californian, and claims she always will. As such, she loves Mexican food. However, since she has a child’s palate, we had to add extra options to engage the cousins, parents and grandparents. Our solution was a multi-faceted taco night with enough proteins and fillings to satisfy everybody. Choices ranged from carne and pollo asada to vegetarian carnitas, seasoned ground beef, grilled shrimp marinated in garlic all the way down to Costco’s Mexican cheese blend (monterrey jack, queso quesadilla, mild cheddar and asadero) for those guests with delicate palates. Of course, the shrimp sold out, but as sometimes happens, I made a bit too much of everything else so we tucked the extras into every spare nook in our refrigerator using all the glass containers, ziploc bags, and tupperware we could muster. The next day, completely spent after cleaning up the house, the remains found their way into the soup pot and we’re back at the first paragraph, having come full circle. The problem with this method of soup-making is reproduceability. How do you do it again? And frankly, before I started this blog, that was always my problem. I tended to just make stuff up and not write down what I was doing. Perhaps this soup was so good because its ingredients had already lived a little before they entered the mix. All that life experience adds lots of flavor and texture. It’s common knowledge among cooks that soups and stews get better the day after they’re prepared. Maybe that’s something that should be understood outside the kitchen as well. But only if you keep celebrating them. FYI: If you’re interested, I know quite a few well-seasoned ingredients who bring a lot to any table and I’m not just talking about myself. Email me. Drain the meat, but don’t wipe off the garlic, onion or cilantro, and grill or broil until well browned. Set aside to cool. Chop the steak into small pieces. Drain the chicken, but don’t wipe off the garlic, onion or cilantro, and grill or broil until well browned. Set aside to cool. Drain the vegetables, but don’t wipe off the garlic, onion or cilantro, and grill, broil our saute until well browned. Set aside to cool. Saute the ground beef with 1/3 cup onions, salt, pepper and Taco seasoning until browned. Drain the meat and set aside to cool. Add steak, chicken, vegetables and ground beef to a 3 quart sauce pot together with stock, refried beans, salsa, salt and pepper. Bring to a boil. Reduce to a simmer for 30 minutes to one hour. Serve warm garnished with shredded cheese blend accompanied by warm tortillas, quesadillas, or tortilla chips. After all these steps a beer might be good too. But that’s your call. 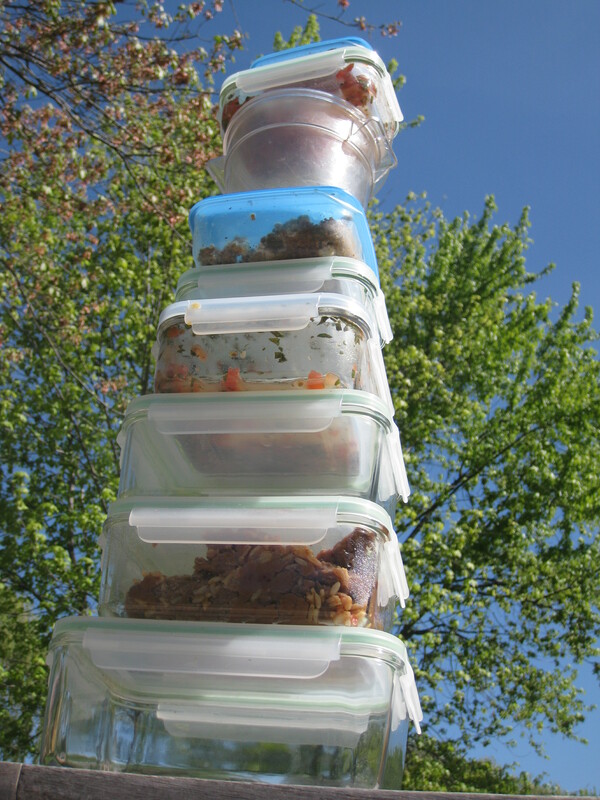 Image Credit: “Experienced” food and container sculpture photographed by the author. It’s art, people! Treat your leftovers with the respect they deserve. Don’t let them die in your refrigerator. Use them! They will surprise you and you might just surprise yourself. Either way: Tell me about it. Thanks for reading. Thanks even more for commenting or helping out your neighbors. I’ll be reading and responding. my mom makes something called fiesta soup. the ingredients are downright embarrassing but somehow it comes out tasting really good. your soup sounds amazing but i doubt the planets will align in my house for it to make it to the table. it sounds like a once in a lifetime occurrence. wish i nearer to you and your beautiful family and soup. great blog. i’m usually a lurker but this post stirred something in me. oh, and I will try the cheese and mushroom soup but probably not until the kids leave for college… they would not be amused. Thanks for coming out of the shadows. Thanks also for the link to tastebook. Looks like a lot of good stuff in there, especially in soup land. Can’t beat Deborah Madison. I was pleased to see the Mexicorn in the fiesta soup recipe. That makes two known uses for that stuff. Good news. Thanks also for the nice words about the blog. Hope you keep reading.